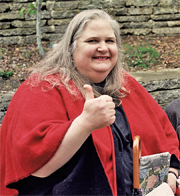 "Ordinary People Can Accomplish Extraordinary Things"
Patricia Walkup, a tireless community activist and founder of the Hayes Valley Neighborhood Association passed away in San Francisco on June 6, 2006. Patricia and many other San Franciscans worked over a decade to bring down the Central Freeway that was damaged in the Loma Prieta earthquake of 1989. Finally, in 2005, the beautiful tree-lined Octavia Boulevard and public green at the upper end, replaced the double-decker freeway that had divided the neighborhood. 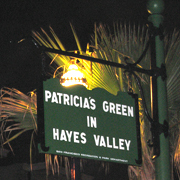 On September 10, 2006, "Patricia's Green in Hayes Valley" was formally dedicated at a memorial celebration for Patricia. It stands as a testament that ordinary people can accomplish extraordinary things. Click on the links below to watch the videos on YouTube. Click below to see Memorial Celebration Booklet. Click Here to Download Memorial Booklet (pdf). La Boulange de Hayes, along with 22 other locations owned by Starbucks is closing. La Boulange on Hayes Street opened in mid-October, 2007. WHERE IS PATRICIA'S GREEN? CLICK HERE FOR MAP. The new Temple by artist, David Best, was installed on Patricia's Green on June 26, 2015. The last Temple by Mr. Best opened ten years ago (June 3, 2005), when the Green was first completed. The structure will remain on Patricia's Green for one year. SF Jazz Center opened January 21, 2013. Click for video of SFJAZZ Center Pre-Opening Tours January 19 & 21, 2013 (7:42). from Lee Walkup on Vimeo. SFJAZZ CENTER officially opened Monday, January 21, 2013, at the corner of Franklin and Fell Streets (201 Franklin) — just 2 blocks east of Patricia's Green in Hayes Valley. A 35,000 square foot transparent structure with a state of the art 700 seat concert auditorium, it is the nation's first free-standing building created for jazz. Designed by award-winning San Francisco architect, Mark Cavagnero, the LEED Gold Certified (Leadership in Energy and Environmental Design) building includes rehearsal spaces, a café, and a glass enclosed ground floor to engage and welcome passers-by. It is with great pleasure that we welcome SFJAZZ to the Hayes Valley neighborhood! CLICK HERE FOR PHOTOS AND THE LATEST NEWS ABOUT THE NEW SFJAZZ CENTER. Street art by London-based artist, Ben Eine, was completed the second week of March, 2011, across from Patricia's Green at Octavia and Hayes. "Brighter Faster" is one of several works Ben Eine has recently completed in San Francisco. CLICK HERE for more pictures and info. And CLICK HERE to read an interview with the artist. CICK ON PICTURE TO SEE ARTIST'S SLIDESHOW. On September 19, 2007, a new glass sculpture was dedicated to Patricia by her long-time friend - artist Mary Lynn Devereux-Bowman of Dallas, TX. Mary Lynn and her husband Jim Bowman are the owners and proprietors of a hot glass studio in Dallas called Bowman Glass (www.bowmanglass.com). They received their formal training at the California College of Arts and Crafts in Oakland. When Patricia passed away, Mary Lynn decided that the best way to express her feelings was through her art. In the written commemoration which hangs on the wall next to the sculpture, Mary Lynn writes: "I give you what I have...my art, my heart, and a tribute to you for the people of the city you love so dearly, San Francisco..."
Click here to download a summary of the Memorial Celebration from the Hayes Valley Voice (pdf). 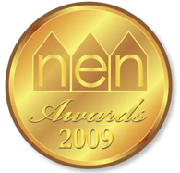 The Hayes Valley Neighborhood Association was honored with a Special Achievement Award by the American Institute of Architects, San Francisco Chapter, on April 30, 2012. The award was announced at a special gala held at the Julia Morgan Ballroom in San Francisco. 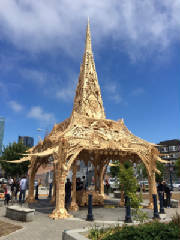 The award reads: "Acting out of positivity and community involvement, the Hayes Valley Neighborhood Association has moved past the status quo to push for innovation in neighborhood organization. Pushing for social, economic, as well as architectural diversity and character, the HVNA has transformed Hayes Valley". CLICK ON PHOTO TO SEE VIDEO. After several years of hard work by SF architect David Winslow, a portion of the Linden Living Alley was dedicated on the afternoon of Thursday, October 21, 2010. The conversion of the east end of Linden Alley (Linden @ Gough) into a pedestrian-friendly, “green” street will provide an intimate social setting for people to linger and relax. We look forward someday to the conversion of the entire two blocks of Linden Street between Patricia's Green and Franklin Street. This would be a wonderful gateway leading from the planned SFJAZZ Center (Linden@Franklin) to Patricia's Green (Linden@Octavia) — and the center of the Hayes Valley Neighborhood. Click here to see video of Linden Alley event. Click for audio "Clip of the Day". CLICK ON MEDALLION TO SEE VIDEO. Click on picture for more photos of piano. 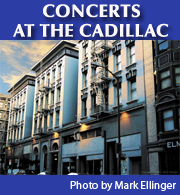 On June 21, 2007, the Cadillac Hotel in the Tenderloin received a rare musical instrument. A fully-restored 1884 Steinway Model D Concert Grand Piano arrived in the lobby. The piano spent most of its life in a castle in Holyoke, Massachusetts. In April, it was purchased by Lee Walkup, brother of Patricia, and shipped from New Haven to San Francisco. Click on the photo above for more info. Or, click on this underlined text to see the NBC11 news video segment from June 22, 2007. CLICK HERE TO DOWNLOAD 4-PG BROCHURE ON HISTORY OF PIANO. If you would like to help with the costs of a permanent memorial for Patricia, please click on the banner above. Donations are now being accepted through the Hayes Valley Neighborhood Association. Please go to the Memorial Fund page for more information. The Recreation and Parks Commission voted unanimously on August 17, 2006, to name the park at Octavia Blvd. between Hayes and Fell Streets: Patricia's Green in Hayes Valley. Thank you to all who worked to support the naming of the green by writing letters, getting signatures, and attending the meetings of the Commission. Patricia worked with others for over a decade on the Central Freeway/Octavia Blvd. Project. The naming of the green is a tribute to all who worked to create this beautiful gateway to the City. Click here to download Rec & Park Minutes from 8/17/06. Click to visit the HVNA website.